Let the spendings diminish! I might finally get some coming back in the bank! Only a small haul this week and I managed to read them all, I love catching up on my To Read Pile! READ! Justice League vs Suicide Squad #3 from DC Comics. Managed to grab the cool Amanda Conner variant for this blatant cash-in of the popularity of the Suicide Squad movie and the anticipation of the Justice League movie. In short, it’s awesome. Written by Joshua Williamson and art by Andy Owens and Jesús Merino, this comics features all the faves from both teams, plus Killer Frost up against an enemy that may be more trouble than both teams can handle! READ! Avengers #3 from Marvel Comics.continuing the Kang storyline by Mark Waid, with cool, painty art by Mike Del Mundo, this comic highlights the new Wasp and her morals and bravery. I think Nadia could be a new star in the Marvel U if she is handled correctly. READ! Champions #4 from Marvel Comics. Written by Mark Waid with art by Humberto Ramos, who if I’m honest, doesn’t tick the boxes for things I like. I feel this comic is starting to lose its way, and this issue felt like it was a comic for kids, with a quick throwaway adventure in which a little is learnt about the Vision’s daughter, Viv, but not much else. This will probably be my last issue of this. READ! Hawkeye #2 from Marvel Comics. Continues the story from the first issue. It still shows promise but I think Marvel are making the same mistakes they made in the 70s with just making female versions of male characters rather than giving them their own identity. This comic doesn’t just suffer from being she-Hawkeye, it also is too reminiscing of Jessica Jones. It does wear these influences on its sleeve, and evenjokes about it, but it might eventually be detrimental. Nice story and art though, hopefully that will be enough to keep it afloat. READ! 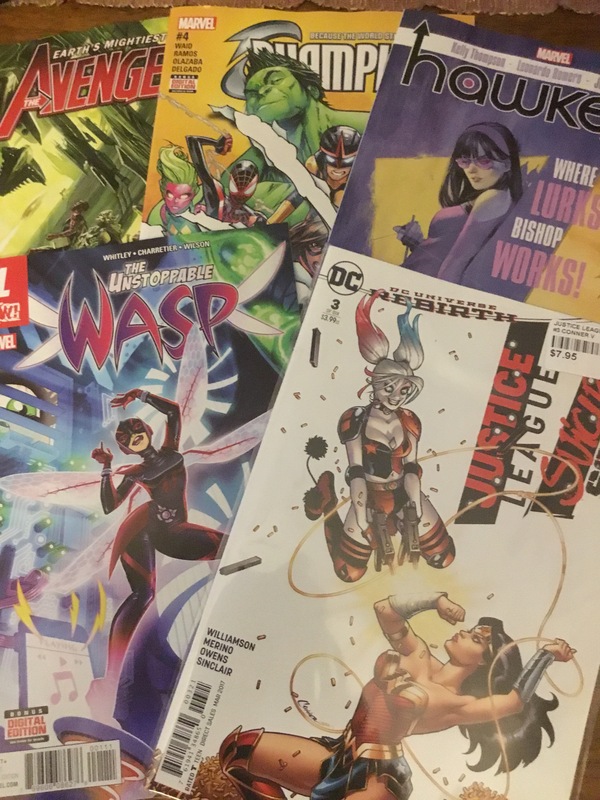 The Unstoppable Wasp #1 from Marvel Comics. Marvel continue their positive female character explosion with an awesome rendition of the Wasp, who is a ‘true’ female character rather than s she-version of another. No longer the Avengers’ Janet Van Dyne, we now have Henry Pym’s daughter from his first marriage, Nadia. This is a cool comic about young girls entering the field of science, and features Ms. Marvel as a contemporary of Nadia’s, and Mockingbird as an inspiration. I hope it lasts a long time as I like the fact that she is a positive intellectual character for young women. Another win from Marvel, like the new Hawkeye and Hulk titles. Nice story by Jeremy Whitley and some cool, fun and cartoony art by Elsa Charretier. 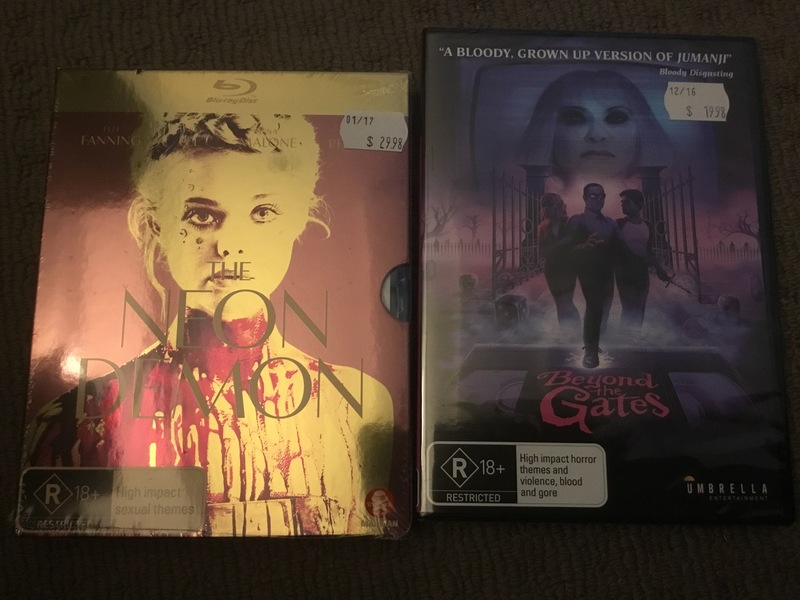 Grabbed copies of The Neon Demon and Beyond the Gates. The Neon Demon I have been following and am excited to finally get to watch, and Beyond the Gates was suggested to me by Simon, who runs the action movie website Explosive Action and the synopsis enthralled me. 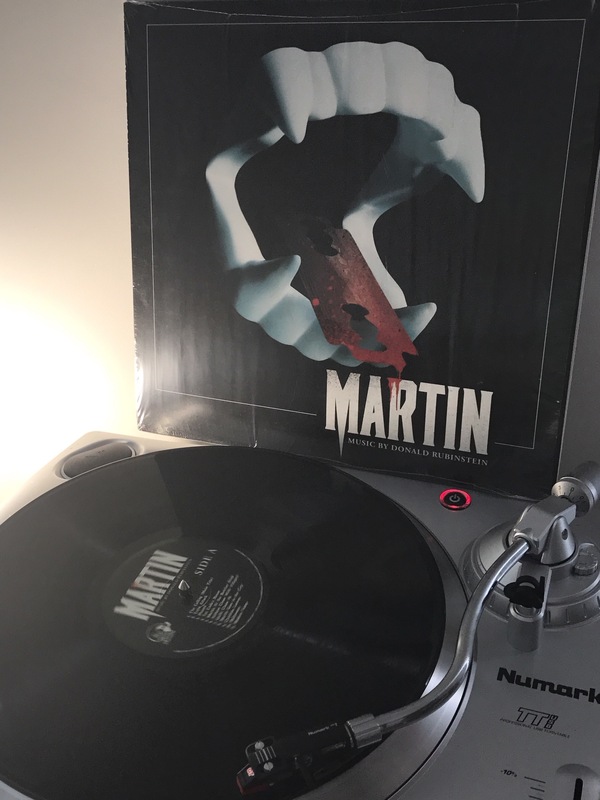 Stage Fright by Simon Boswell is a cool synthy soundtrack from the awesome American styled slasher film/ giallo from the 80s. The design of the cover is amazing, and the music is exactly the sort of thing I like. 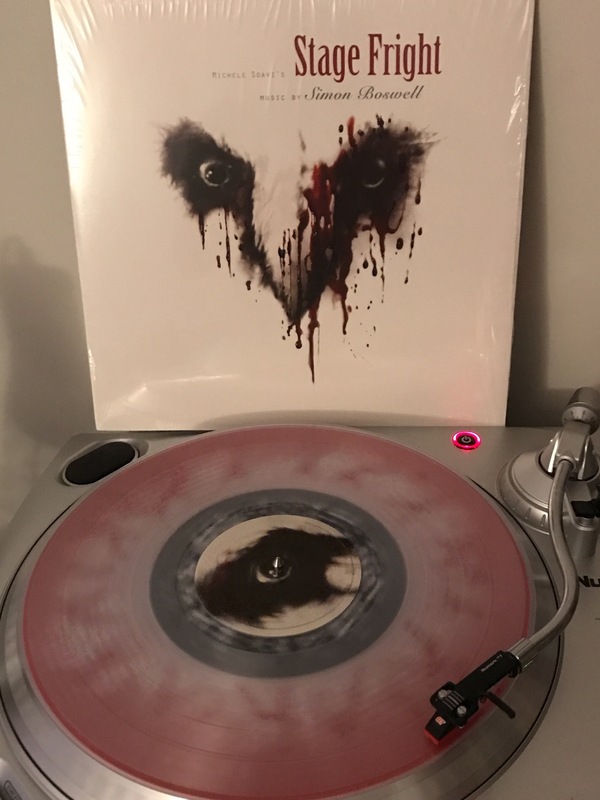 This edition is on a pretty cool clear vinyl. 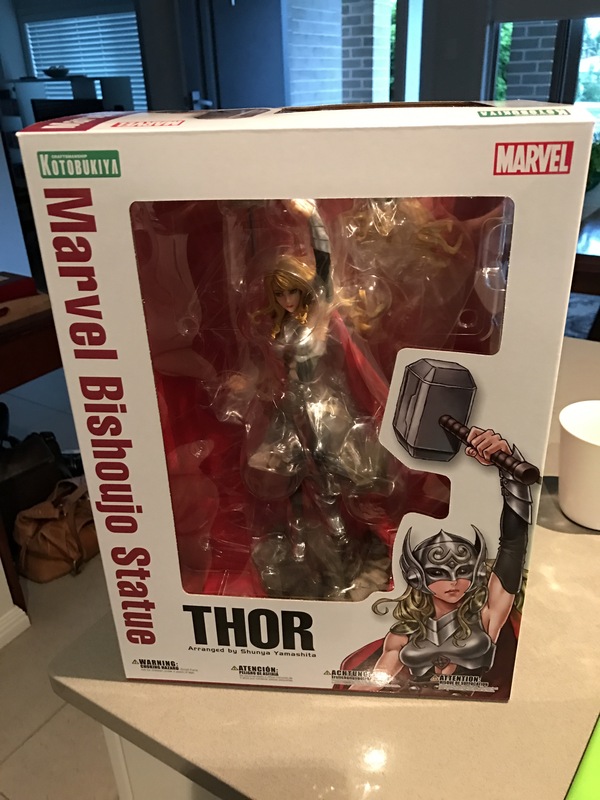 A surprise delivery today with this Lady Thor Bishoujo figure from Kotobukiya! No doubt I’ll have a YouTube video for the Unboxing of this beauty soon.